Firefighter Clive Savacool battled his final blaze, a grass fire in Pittsburg, California, in March 2014. He collapsed after a few hours on the scene and spent the next couple days in a hospital. "Up until that point, grass fires hadn't bothered me," said Savacool, 37, of Martinez, California, recalling how his pulmonary doctor later concluded that cumulative toxic exposures during 18 years of fire service had given him career-ending lung disease. Savacool, however, would be far from done protecting others. Less than a year later, the retired battalion chief turned his illness into inspiration for an innovative tool. 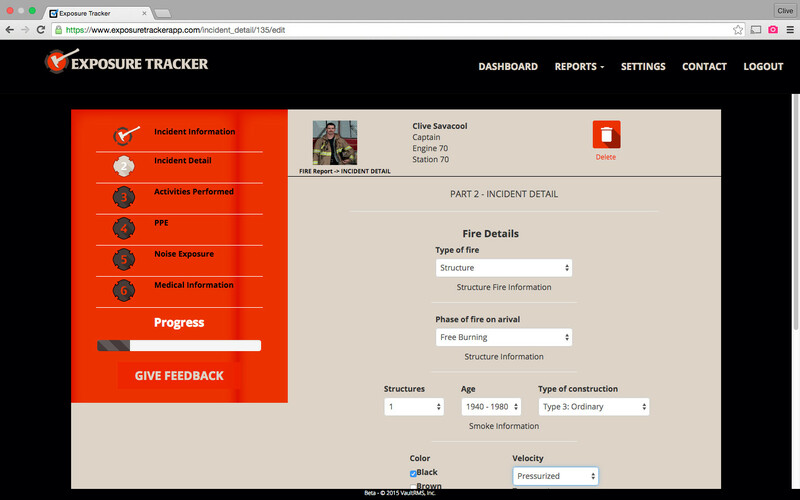 His cloud-based Exposure Tracker, launched in February, allows firefighters to document exposures to toxins and communicable diseases, as well as injuries, through their careers. "My long-term goal is to make a big dent in firefighter death statistics," Savacool said. The new product, for which Savacool received help from the U.S. Centers for Disease Control and Prevention and the National Institute of Occupational Health, is among efforts to respond to elevated levels of toxic chemicals, as well as high rates of cancer and other chronic diseases, among active and retired firefighters. Fighting a fire means confronting burning chemicals and their byproducts, which can add to the danger. As legislative battles wage over bans on some of the culprit chemicals, such as synthetic flame retardants added to furniture and electronics that may not actually retard flames, health experts are working to improve protection for those who staff America's firehouses. They're urging decontamination of gear after fires, for example, as well as the provision of backup gear that can be ready while that first set is cleaned and dried. "I'm surprised how many departments don't have backup gear. It's really key," said Susan Shaw, director of the Marine And Environmental Research Institute in Maine and professor of environmental health at the State University of New York-Albany School of Public Health. She has been touring U.S. firehouses to compare practices and share information. "But I am finding a huge effort to reduce exposures and protect firefighters," Shaw added. She noted a rising -- albeit still insufficient -- use of measures, like attaching hoses to the tailpipes of fire engines parked inside stations to safely vent exhaust gasses, and state-of-the-art decontamination machines. The push may be all the more urgent in places like California, where experts warn that drought conditions may spark and more quickly spread both wildfires and house fires. "Last year we ran twice as many multi-alarm fires as we did in the previous several years combined," said Roberto Padilla, spokesman for the Sacramento Fire Department, noting that wood shingles and rafters lose fire-retarding moisture during dry periods, just as brush and trees do. "This year is probably going to be the same. "Obviously, with how things are built and constructed now, the way it burns and the chemicals released from today's fires are a lot more toxic than in years past," Padilla added. He said his department provides firefighters with respiratory protection as well as education about the importance of using it, even after they've suppressed the flames. Smoldering furniture and electronics, said Shaw, may emit some of the most toxic smoke and soot. She said she's discovered a lot of inconsistency in protective practices. The Seattle Fire Department, for example, has offered backup gear for a decade, while some older cities along the East Coast have not -- largely a result of funding, she said. Kyle Moore, a Seattle Fire Department spokesman, said other strategies have been incorporated into new and remodeled stations around the city, including strict separation between areas housing the trucks and gear, and where the firefighters eat and sleep. "The newly built decontamination rooms allow firefighters to take off their bunking gear and decontaminate the gear or themselves before entering the living quarters," Moore said. Documentation appears to be hit or miss, said Shaw, noting that many cancer-stricken firefighters are denied worker's compensation claims because they lack a documented history of exposures. Shaw called the Exposure Tracker an "extremely valuable" new tool. Savacool and his co-founder, Chris Memmott, plan to roll out an app for Apple devices within the next couple months and integrate the system with wearable air monitoring devices by the end of the year. Two major California fire departments have already signed on, he said, and an additional 50 from around the country have expressed interest. "It's not only monitoring behavior, but also creating some education," said Savacool. "If we're asking the question, it probably means you should be doing it." "The software won't say that firefighters battling this fire were exposed to this list of chemicals," Savacool said. "But based on the information, over time, we can make an educated guess." Firefighters can be exposed to toxins by breathing or ingesting them, as well as by skin contact. A firefighter's body temperature naturally rises while battling a fire. And with every increase in temperature of five degrees, Shaw explained, the skin's ability to absorb toxins increases four-fold. "Pores of the skin are opening up and just welcoming in the chemicals," she said. "And if you have to wear dirty gear over and over again, you have ongoing exposure through the skin," Shaw added. "It's the perfect storm for exposure in firefighters." Levels of a common flame retardant measured in the blood of San Francisco firefighters was two to three times higher than the levels found in average Americans, according to a study published by Shaw and her colleagues last year. A study by the U.S. National Institute for Occupational Safety and Health, released in October 2013, found higher rates of cancer in 30,000 U.S. firefighters than the general population. Other recent studies in Australia, Finland and California have found similar trends. More research is underway, including a national study, headed by Shaw, which seeks to better connect exposures and health effects and a study focused on breast cancer among women firefighters. "What we're seeing is more cancer," said Shaw. "We're seeing it in younger firefighters. We're seeing rare cancers." "Firefighters are an extreme case, but all Americans are exposed," she added. In fact, firefighters are becoming vocal advocates in the public health community's push for stricter toxic chemical legislation, both at the state and national levels. Tony Stefani, president of the San Francisco Firefighters Cancer Prevention Foundation and an investigator on the breast cancer study, is a retired San Francisco Fire Department captain and cancer survivor. He has been traveling the U.S., testifying before state legislatures in support of bills to ban flame retardants. The information provided by Exposure Tracker, which Savacool volunteered for use in the breast cancer study, may strengthen the case for restrictions on certain chemicals, said Stefani, who lost a fellow firefighter who also was a foundation board member to a rare form of nasal cancer on Sunday night. "Having this type of information is really important," Stefani said. Karen Stone, a retired lieutenant who served for 18 years with the San Francisco Fire Department, is a volunteer in Stefani's study. She, too, lost a close friend in the service to cancer. "When you become a firefighter, you don't think of joining the chemical industry," she said. "You know you'll be going into burning buildings," Stone added. "But you don't think this could be one of the dangers."